The high average cost of bunker fuel over the past decade led to increased interest in fuel efficiency. Shipowners have a difficult time demanding higher rates in response to cost increases. This makes any savings they can realize on operational and fuel costs critical. Fuel costs account for about 70 to 85 percent of the cost of running a ship, so savings realized in consumption go to their bottom line. Ships which travel at a higher speed, such as gas carriers and container vessels, see the highest percentage adaptation. This is due to the fact that the speed/consumption curve grows steeper the faster a ship travels. It does not take much energy to move a ship from stationary to 2kts, but it takes a large additional amount of power to push it from 15kts to 17kts. The trend is not limited to the swifter vessels though. 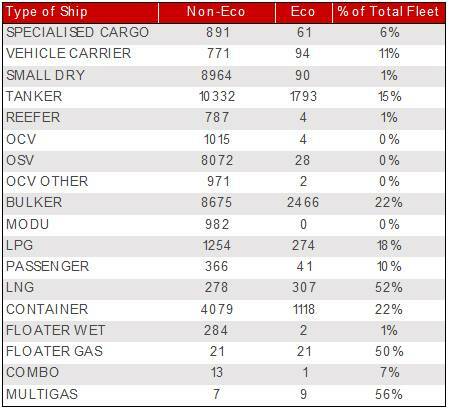 Beginning in 2016 over half of all ships ordered were for Eco specs, and it now stands at 80+% of outstanding orders. Ship builders responded to owner’s desires for cost savings by offering better engines, hull forms, and propellers as well as other marginal improvements in design to reduce fuel consumption. The trend in owner adaptation of Eco ships can be seen in the charts below. Oil prices have been softer in the past two years, but remain a significant drain on owner’s coffers. Demand from charterers for faster delivery of oil has not been an issue for a while now, and they seemed to have accepted a structurally slower fleet. This is increasing preference by all parties for more efficient ships, even if they lack the high top end speeds that many wanted during the commodity super cycle in the 2000’s. These ships may or may not demand a higher time charter rate, but as bunker prices increase the likelihood is that the earnings they could potentially command will increase. Newer Jones Act tankers have been built with Korean yard designs, including Eco engines. However, the depressed market returns make future orders on the basis of fuel consumption alone unlikely. Any new order that is placed in a US shipyard would almost certainly opt for the most efficient engine due to the small incremental cost of improving the engine when compared to the $100mn + price tag already incurred for building at the high cost yards. Currently 23% of the US tanker fleet and 19% of the container ships are run with Eco type engines. The premium for Eco type ships can run to about 5% of the total value depending on the overall price of the asset. This makes it a valuable specification, and one that may become even more precious after the fuel transition in 2020. The ability to save tons of fuel per day can add up to hundreds of thousands of dollars per year, and translates directly into higher TCE returns for the ships. Survival in the shipping markets can often rest on razor thin margins during periods of weak returns. Since most markets are in a depressed state, the value of Eco type ships can mean the difference between living to the next bull market or liquidating assets at the bottom of the cycle.